Regina Alcabes Avdala belonged to a family of Jewish-Bulgarian origin that, after alternating between Peru and Bulgaria, settled in the South American country in 1932. She received her initial artistic training at the Escuela Nacional de Bellas Artes (Lima, 1937-1943). Among her teachers were José Sabogal, Camilo Blas, and Julia Codesido. She married Arieh Aprijaskis upon completing her art training. Traditional and indigenous themes as well as nudes were predominant in her paintings until she traveled to New York during the 1950s, where she had the opportunity to see abstract expressionist painting and geometric abstract art. She attended the Art Student League (1965-1967) and, under the tutelage of Theodore Stamos, she immersed herself in the practice of abstractionism. A set of exercises that have been preserved from this stage reveals a persistent search for linear synthesis in both her abstract compositions and her nudes. In 1967 Aprijaskis settled in Lima. In her Paracas series (1967), despite her inclination toward abstraction, there is in this series a clear reference to landscape inspired by views of “pisqueño” sites on the southern coast of Peru which she synthesized through straight lines and stripes, not quite regular, painted with diluted acrylic pigments appearing like watercolor. 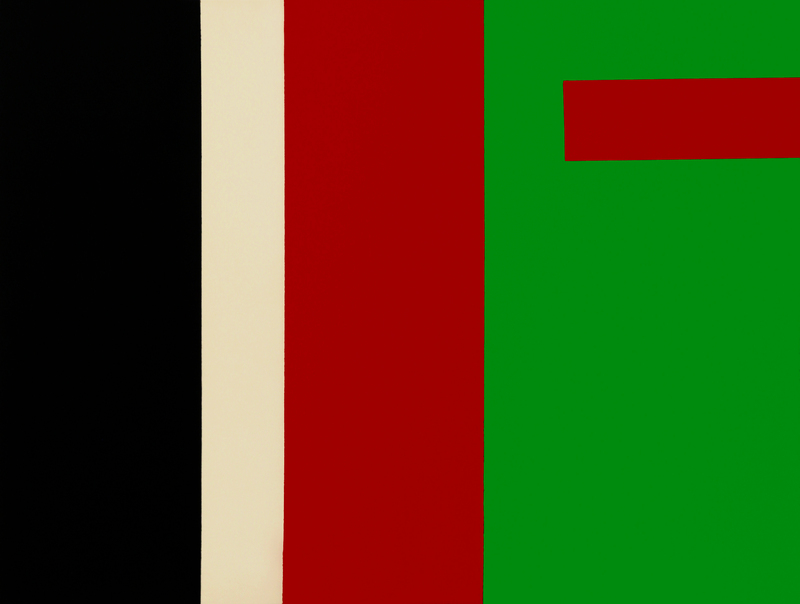 In the series Espacio y Green Port (1968), which is fully geometric, the landscape lines that were hinted at in the previous series were replaced by lines and stripes that followed abstract horizons and transformed each of her paintings into explorations of space and depth. Aprijaskis presented these works in her first solo exhibition organized by the Instituto de Arte Contemporáneo (Lima, 1968). The critics praised her lyrical style and her use of color. Shortly after this show, she stopped painting to work in the family’s business. In 1984, Luis E. Lama, director of the Sala Luis Miró Quesada Garland (Miraflores), encouraged her to exhibit again. It took her a decade to produce the exhibition that marked her return to the art world in 1995. Among the new works she presented was a series of large format acrylic paintings with compositions of bright and colorful planes, whose superimpositions and chromatic characteristics suggested volumetric constructions that are almost architectural. Another group of smaller acrylics showed tridimensional geometric figures with similar coloring. It is evident that forms in the first series corresponded to the flat views, based on carefully selected angles, of the forms represented on the second series. From 1995 on, Aprijaskis exhibited her work on a regular basis, particularly at the Sala Luis Miró Quesada Garland (1997, 1999 and 2001). Austerity characterized the limited choice of color of her new paintings. In her work dating from 1996, the palette was reduced to black, white, red and grey (although in the following years she used colors present in earlier works). Shapes were exclusively vertical bands or, in a few cases, horizontal ones, whose different width and alternation determined the rhythm of the compositions. Aprijaskis transitioned to sculpture for her 1997 exhibition. She presented a large format piece that followed the same esthetic rationality and rigor of her paintings. Art critics credit her for introducing Minimalism to Peruvian art. Regina Aprijaskis: 60 años de pintura. Lima: Galería Germán Krüger Espantoso, Instituto Cultural Peruano Norteamericano, 2004. Román, Élida. Regina Aprijaskis. Lima: Jaime Aprijaskis Alcabés, 2010.